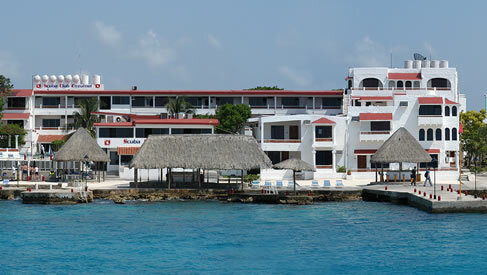 Scuba Club Cozumel offers three types of rooms – Single, Double, or Triple. All rooms have AC, ceiling fans, hair dryers, alarm clocks, and a small refrigerator. Finished in tile and stucco, they are ready for wet divers and have drying racks for dive suits on each terrace. Since a diving vacation should also be relaxing, rooms are not equipped with a TV or a telephone, but instead are spacious, comfortable and have an individual character with a feel of Mexican heritage. Most rooms have an ocean view. Single rooms feature a King size bed, Double rooms feature two double beds. The Triple rooms are ideal for families as they are larger and have two double beds and an additional sitting area with a twin-size bed. Many of the rooms on the ground floor are just a few steps away from the beach, and a few rooms have been remodeled to accommodate the needs of handicapped divers. 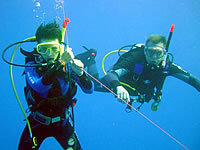 Scuba-Cozumel is the in-house dive operation for Scuba Club Cozumel resort. This PADI 5-Star facility and full service dive center is located inside the hotel premises and includes an air filling station consisting of four compressors and a four-stage filtering system, a full line of rental gear and basic repairs shop, as well as an International Training Center, with a full-time staff of PADI instructors, offering specialty courses and certification at all levels. All diving activities and dive trips are coordinated and scheduled here. A fleet of seven customized diesel boats are available to safely transport divers to the dive sites. The boats are different sizes and can accommodate from 10 to 20 divers. Equipped with dive platforms and sturdy ladders, marine radios, oxygen and first aid trained crews, they will be ready for boarding every morning at the Club’s comfortable pier, right after breakfast. Diving guests are normally assigned to the same boat, crew and underwater guide for the length of their stay. You’ll also find great diving right offshore from the resort. The jagged ironshore limestone wall gives refuge to many juvenile reef fish, lobsters, crabs, octopus, and even an occasional seahorse – great for macro photography. Depth is about 15′-25′ and access is easy from either of the piers using the specially built stairs, complete with hand rails. A very easy exit is found through a tunnel, that leads to a waist deep saltwater pool and a short staircase up to the deck. Night dives here are fantastic offering unique and memorable creature encounters. Also, downtown San Miguel is the hub of all island activities and comes alive on Sunday nights when the residents of Cozumel and their children (dressed in Sunday finery) congregate in the town square between 7:00 to 10:00 pm. The food is excellent and plentiful at Scuba Club Cozumel, so no matter how big of an appetite you work up on your morning dive, you won’t be disappointed or hungry when you leave the table here! Meals are included in your package at Scuba Club Cozumel and they are served at their two restaurants located in the center of the resort at “the Fat Grouper Grill“. Downstairs is open-air for breakfast buffet style and sit down diver’s lunch, with a bar and two TV monitors for watching sports and reviewing the days video production. 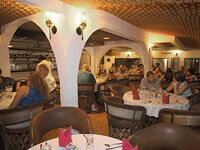 Upstairs is the main dining room, which is air conditioned and has an ocean view for spectacular sunsets. Every evening there is a different selection of delectable entrees, comprised of red meat, poultry, seafood, and fresh vegetables, with a taste of the cuisine from the Yucatan region. Vegetarian meals and special diets can be prepared on advanced notice. Usually once a week they have a Mexican beach party, featuring the best of Mexico’s cuisine with a delicious buffet dinner of tacos, quesadillas, sopes, chilindrinas, codzitos, nachos, guacamole & salsas and much more. Served on the beach under the stars, the festivities are completed with a piñata bashing enjoyed by all!